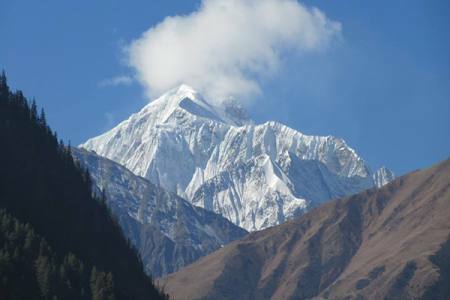 Humla is the most remote district in Nepal. There are few tourists, and those you meet will most likely be headed to the border town of Hilsa, a stepping-stone to Mount Kailash in Tibet. 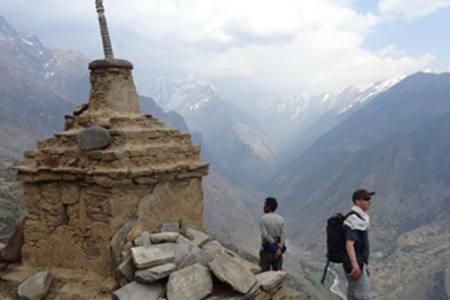 From the district capital of Simikot, spread across a ridge at 2900m, the Great Himalaya Trail follows the old salt trading route to Tibet. The trail threads along towering green cliffs above the roaring Karnali, the longest river in Nepal. You’ll pass clusters of flat-roofed mud houses, encountering Thakuri women wearing heavy gold and silver jewellery, and Thakuri men leading flocks of long-haired goats up and down the muddy trail to Tibet. As you approach Hilsa and the northwestern border, the landscape becomes drier, and the context, Buddhist. It’s possible to turn southeast into the Limi Valley’s incredible red rockscapes and mediaeval stone villages. Beyond lies a glacial valley below the 5000m Nyalu pass, with the aquamarine Tshom Tsho Lake providing remarkable contrast with the burnt sienna of the treeless expanses.